On Tenrife, just south of the caldera rim. 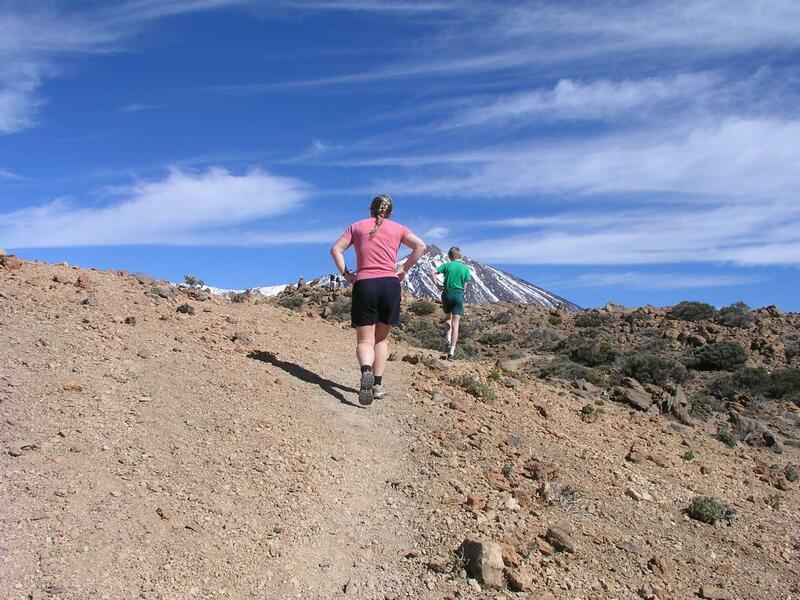 How to get there: This mountain is best accessed from the road to Teide, but before entering the caldera. From the village of Vilaflor on the south side of the national park, proceed up the highway for 8.5 kilometer. That is, the trailhead is located between kilometer markers 60 and 59, just before a large left curve. On your right hand side, locate a couple of old stone buildings, pull off the highway and park here. There is parking for about 5 cars in this area. Route description: The trail starts out from the stonehouses, walk just on the upside of the house that is closer to the downhill direction of the highway. At first, the trail runs parallel with the highway (in the direction of Vilaflor), but without loosing much elevation. The trail is marked by white paint and stone cairns. Shortly, there is a fork in the trail, pick the uphill (left fork). The trail now climbs a ridge, then follows this ridge further uphill. 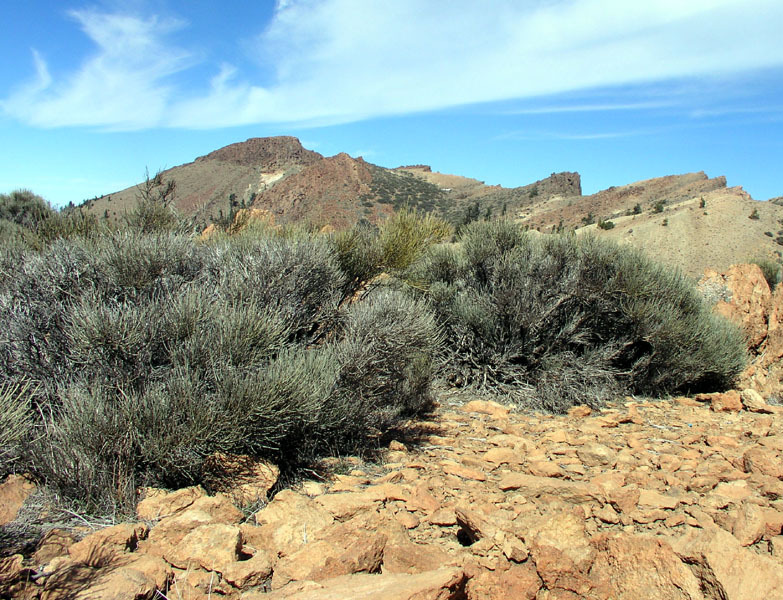 The slope eases off before the last climb to the caldera rim. There is a trail running more or less along the edge of the rim. Head towards the right and descend slightly to a small saddle. The mountain Sombrero de Chasna is the flat feature that is slightly downhill to your right as you head east while descending only a few vertical meters. There is a clear trail turning the first few rocks on the left side, then entering a small, short gully where the trail is (YDS) class 2 for about 5 meters (otherwise, this hike is a class 1 hike everywhere). 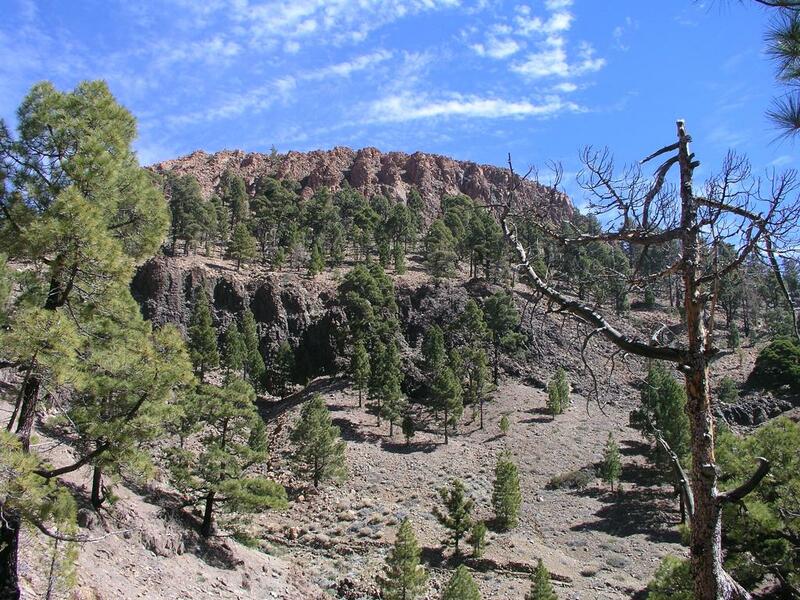 One should hike around the circumference of the circular formed mountain in order to enjoy the views down the south slope of Tenerife to Vilaflor and further all the way to the ocean. For the return hike, locate the trail that descends to your left shortly after descending the short class 2 gully. That is, down the valley on the west side of the mountain. 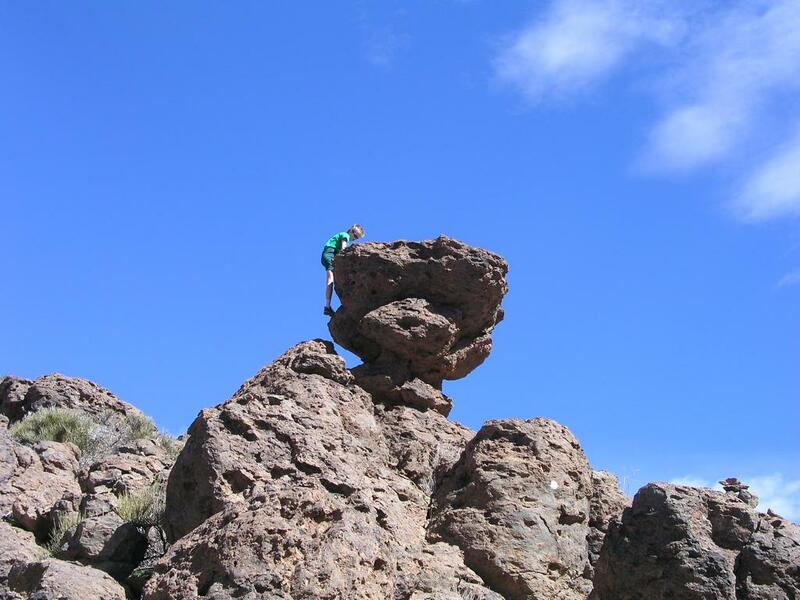 You do not climb back onto the rim of the caldera. This trail descends in the valley, then contours right around the ridge that was followed going uphill, before merging with the outgoing trail shortly before the trailhead. Comments: This was a half day family hike, we started around 10 and were back by the car around 1230. This mountain is an excellent example showing how the primary factor or prominence may not be very meaningful. 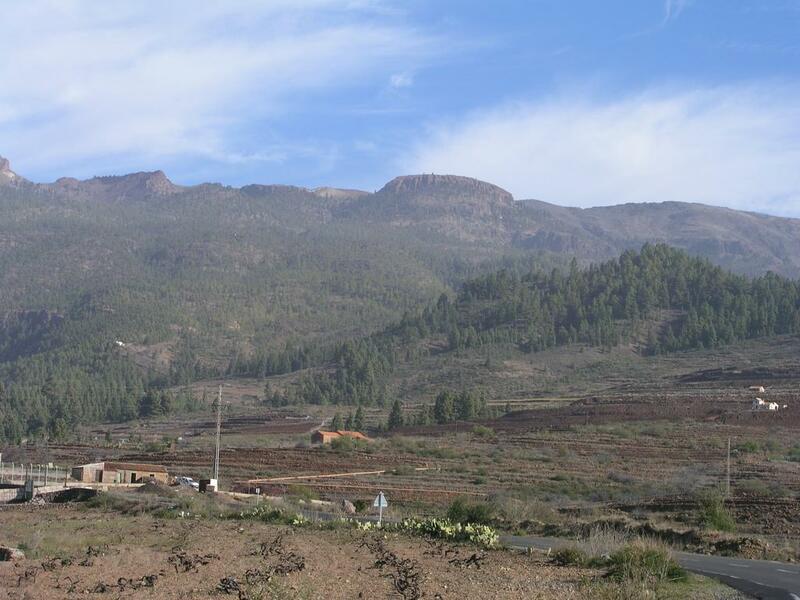 This mountain, overlooking the village of Vilaflor, is dominating the skyline when viewed from the populated areas. What nobody sees is that the rim behind is slightly higher. The same effect is often observed in Norway and elsewhere, the highest, perhaps most characteristic peaks, that are visible from populated areas are named while possibly higher mountains that cannot be seen from below, hardly have names at all. Sombrero de Chasna, as seen from the populated areas near the village of Vilaflor. Sombrero de Chasna, as seen from the trail below. 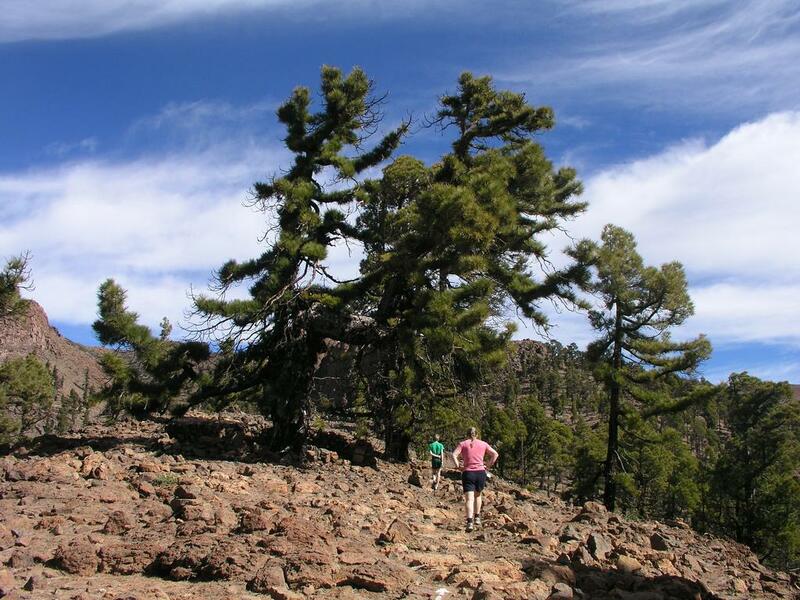 An interesting pine, while hiking towards the caldera rim. 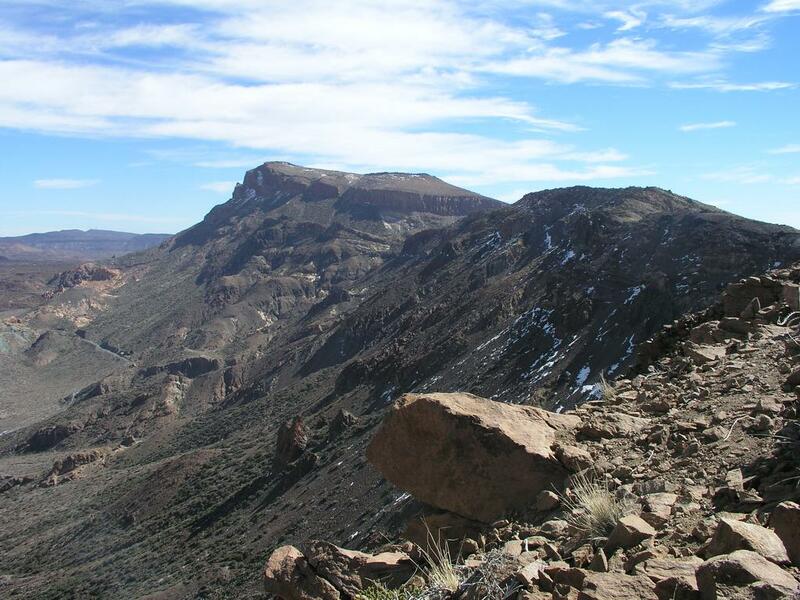 Near the rim, El Teide comes into view. Montana de Guajara, as seen from the west. Pål Jørgen climbing, a very peculiar rock. 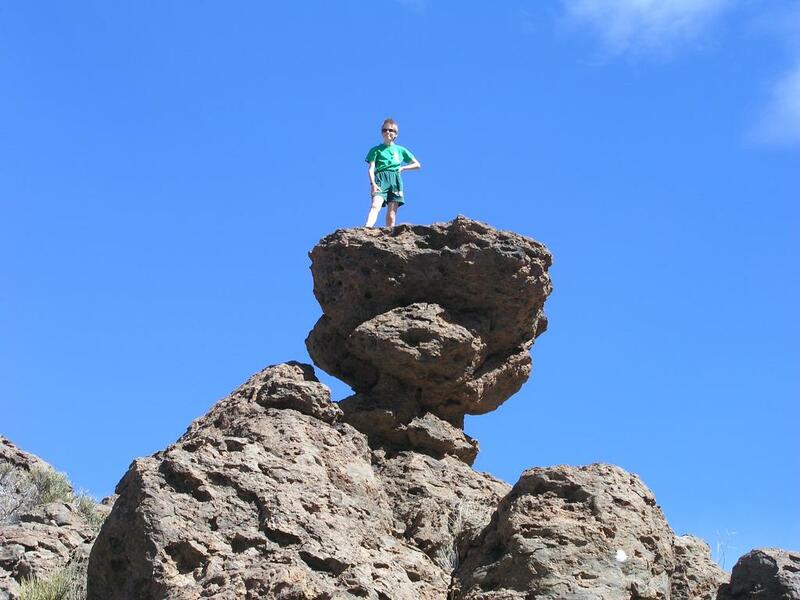 Pål Jørgen, on top of the strange rock.